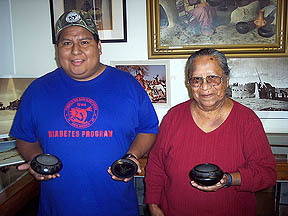 Johnny with his mother Sunset displaying some of his pottery. Johnny, a Tewa Native American Indian from San Ildefonso Pueblo, come from a family of traditional pottery makers. His Great-Grandparents were none other then - Julian and Maria Martinez. Johnny is carrying on their pottery making of black-on-black, along with his Grandparents, the late Adam Martinez and Santana Martinez. Johnny stated, 'I am looking forward to being a great potter too. 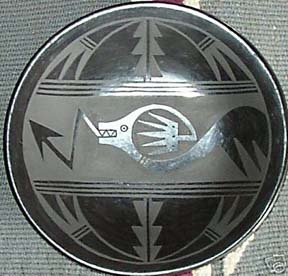 Their designs are unique, using various designs that are part of the Pueblo Style. I am grateful for taking the vocational education program in traditional Tewa pottery ware.' Evelyn Naranjo has been his main instructor and is an excellent teacher.